In some instances damage to exterior walls may be more substantial and merely grinding out cracks and filling them with sealants will not suffice. Reports from Structural Engineers or Building Surveyors often recommend (assuming the damage is not so bad as to need underpinning) the stabilisation of external wall cracks using steel helibar fixings and/or the insertion of expansion and movement joints. 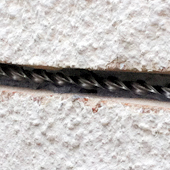 This form of 'crack stitching' using steel bars inserted in to a bonding resin, usually within the mortar joints in brickwork, has proven a very reliable and permanent solution to stubborn and larger wall cracks. ﻿In some instances exterior wall cracks are more severe and can often run vertically from ground level to much higher up the wall. In these cases merely filling the crack is simply not sufficient as the crack develops not only through the outer layers of render but also deeper in to the brick, stone or block work behind. The insertion of horizontally placed 'helical' steel bars helps to strengthen the wall and provide enhanced stability. The 'helical' steel bars are then encased in resin and, once the resin dries, are coated over to completely disguise the repair and leaving the wall in the chosen unblemished decorative finish. 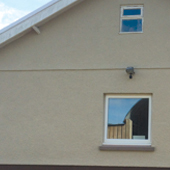 Homeshield are experts in the installation of such remedial systems and subsequent 'making good' of the wall surface to achieve a decoratively superb finish. 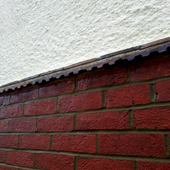 ﻿Homeshield provide a full or partial re-pointing service. It is recommended that following re-pointing the bricks and mortar are coated with a clear silicon coating to further protect them from on-going weathering and penetrating damp. 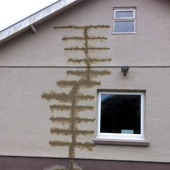 Please note: Homeshield always recommend the commissioning of a Structural Report in cases where severe cracks have appeared in exterior walls.